Richard Davoud Donchian (born September 1905, Hartford, Connecticut – d. 1993) was an Armenian-American commodities and futures trader, and pioneer in the field of managed futures. 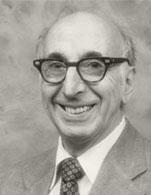 The first publicly managed futures fund, Futures, Inc., was started in 1949 by Richard Donchian. He also developed the trend timing method of futures investing and introduced the mutual fund concept to the field of money management. Richard Donchian is considered to be the creator of the managed futures industry and is credited with developing a systematic approach to futures money management. His professional trading career was dedicated to advancing a more conservative approach to futures trading. Richard's parents were Armenian immigrants from Western Armenia which was part of the Ottoman Empire back in the 1880s and had come to settle in the USA. As a young man Richard went to school in Connecticut, later graduating from Yale University with a BA degree in Economics. He later receives his MBA from MIT Sloan School of Management. Richard's first taste of the job market was as an assistant in his family’s Oriental rug business. During this time Richard came across the fictionalized biography of stock market whiz Jesse Livermore titled Reminiscences of a Stock Operator, After reading this book Richard became so fascinated that his interest turned to studying the financial markets. During the market crash of 1929 he lost some money. This experience led him to study technical analysis and become a student of price history alone and for its own sake. Richard began his Wall Street career in the 1930s. He published a very popular stock market service called Security Pilot which he sold to brokerage houses. During the summer of 1933 he became an account executive and securities analyst with Hemphill, Noyes and Co, while still working as the Vice President of the Samuel Rug Company. World War II would take Richard into the US military and participation in the invasion of Sicily. He was later promoted to Air Force statistical officer. After the War he became a private investment adviser and securities analyst. Richard was self-employed until 1960. In 1948 he changed his focus from securities analysis to active trading and developing his rule based technical system. He established the trading firm Futures, Inc., which was then one of the first publicly held commodity funds. Richard developed a rule based trading approach which became known as Trend following. It is based on the assumption that commodity prices moved in long, sustained moves. Richard developed and used a trading system that incorporated Trading rules, Trading guidelines, and his weekly rule system based on moving averages. He wrote many articles on futures trading and securities and became known as the father of trend following. In 1960 Richard was appointed Director of Commodity Research with Hayden Stone where he commenced writing a weekly newsletter, Commodity Trend Timing, based on his 5-20 moving average method. His newsletter was very popular, reaching a weekly circulation of some 10,000 copies during the 19 years he wrote it. Richard wrote numerous articles which are considered industry classics, including Trend Following Methods in Commodity Price Analysis. Richard would remain with Hayden Stone's various successors, including Shearson/American Express, and later joined Shearson Lehman Brothers, eventually becoming Vice President of the firm. During his career he was a member of several exchanges, such as the New York Cotton Exchange, and several professional market associations, such as the New York Society of Security Analysts. Many modern trend following systems, such as the Turtle Trading system, are based on his work. The Richard Davoud Donchian Foundation was established after his death in April 1993; its aim is to make improvements in Children's Health and to help its ultimate recipients become empowered to strengthen and build up their families and communities — passing onto others that which was given to them. This page was last edited on 27 September 2018, at 08:39 (UTC).